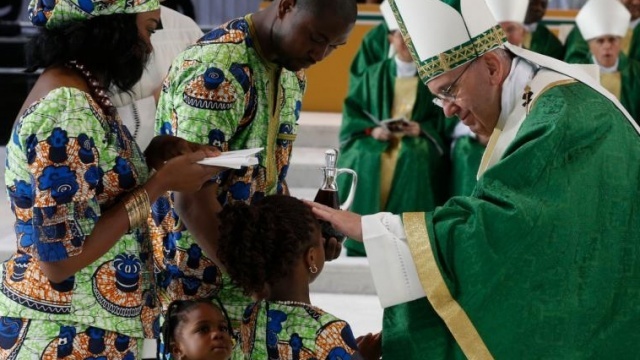 The Pope will arrive at the last stop of the apostolic journey on Saturday morning, in Philadelphia, the former American capital and the city of philos. In this city, the Declaration of Independence and the Constitution of the United States were signed. And in this city, the World Meeting of Families and the Apostolic Journey are taking place, two events that will prove to be historical in the American Church. In this series of blog posts, I have hoped to show you the beauty of churches everywhere. The beauty does not only consist in the architectural grandeur or artistic decorations, but also in the historical significance and devotions of the people, past and present. Churches anywhere in the world fascinate me, as they are the physical and visible symbols of the intersection of liturgical, historical, architectural and ecclesiastical dimensions of the local Church. I hope that you will also grow in love with houses of God as I do. If you are ready, sit tight, as I will bring you to important churches in the city of brotherly love. Philadelphia was one of the first dioceses that were created out of Baltimore in 1808. The importance of a diocese is related to the number of cardinals. Since Philadelphia’s promotion to archdiocese in 1875, it has had 9 archbishops, 5 of whom are cardinals. The Cathedral Basilica of Sts. Peter and Paul was built from 1846 to 1864 on a Roman cross plan. The church was designed in the Roman-Corinthian style and modelled after the Basilica of Sts. Ambrose and Charles in Rome. A huge Renaissance vaulted dome rises 48 metres above the floor, enabling an undistracted and spacious nave. 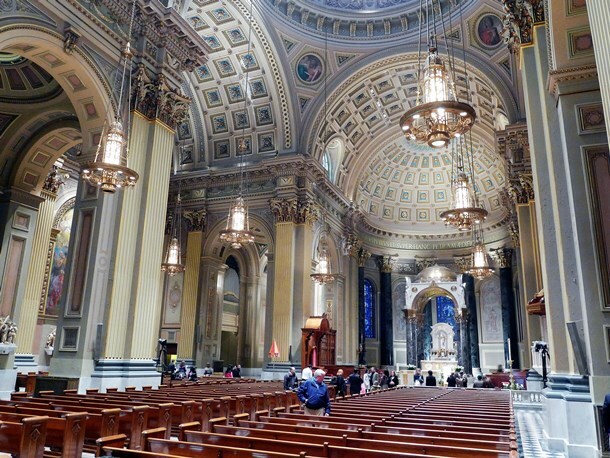 The highlight of the golden interior is the marble baldachin with a bronze dome above the altar, emphasizing the centrality of the altar and the Eucharistic sacrifice. Two large paintings are found in the transepts, depicting the Adoration of the Magi and the Ascension of the Lord. 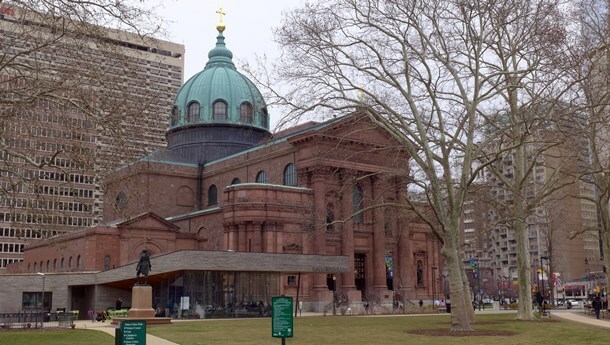 Philadelphia is the seat of two Catholic metropolitan sees: the Latin-rite Archdiocese as well as the Ukrainian Byzantine-rite Archeparchy (“eparchy” is an Eastern-rite diocese that is outside the proper territory of the particular Eastern Church). The large number of Byzantine-rite Catholics in the area is the result of immigration of many from Austria-Hungary in the late 1870s. The Byzantine Catholics were given an Ordinariate in 1913, until 1924 when it was ritually split into two apostolic exarchates of Ruthenian and Ukrainian rites. The latter was based in Philadelphia, and was promoted to metropolia in 1958. The Cathedral of the Immaculate Conception is modelled upon Hagia Sophia in Istanbul, the original patriarchal cathedral of the Byzantine empire. The dome is spectacular with golden paint from the outside, but looking from the inside is a mosaic of Christ Pantocrator. 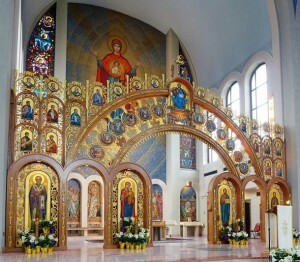 The wall in the sanctuary depicts the Theotokos (Mary the God-bearer). The four major icons on the lower level of the iconostasis (wall of icons separating the nave from the sanctuary) include St. Nicholas, the Mother of God, Christ the Teacher and St. John the Baptist from left to right. John Nepomucene Neumann was a Redemptorist priest from Bohemia (now Czech Republic) who became the Bishop of Philadelphia in 1852. 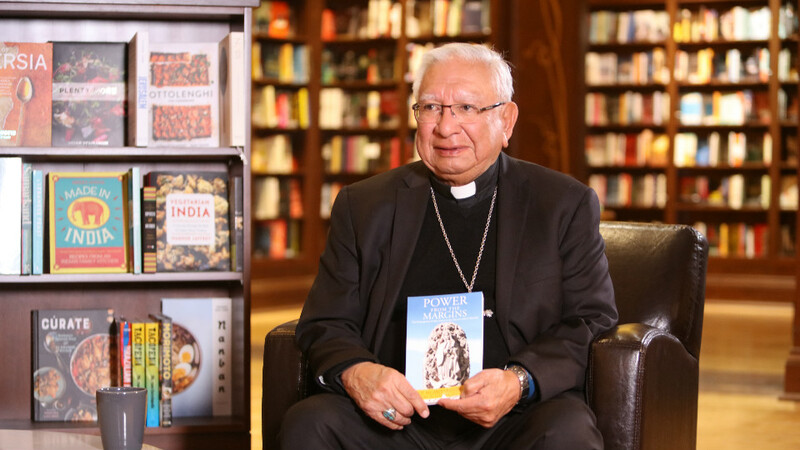 The holy and frugal bishop was the first one in the country to organize a diocesan school system to care for the children. After his death in 1860, he was beatified during the Second Vatican Council and later canonized in 1977, becoming the first American male to receive this honour. 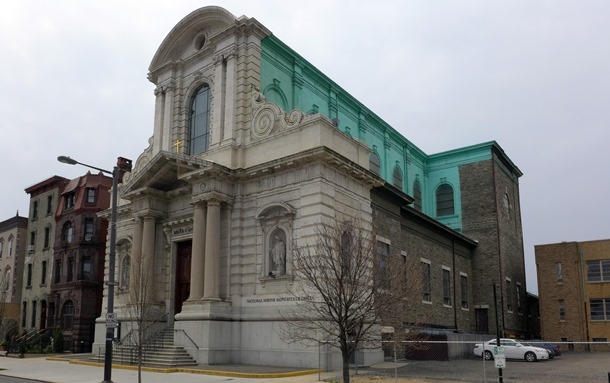 The Redemptorist Church of St. Peter the Apostle in Philadelphia, built in 1843, is also the home of the National Shrine of St. John Neumann. His body as well as a museum showcasing his life can be found on the left side of the church. In 2009, a fire broke out, burning the pulpit to dust, but the body of the saint suffered no damage. Many consider this as a miracle. 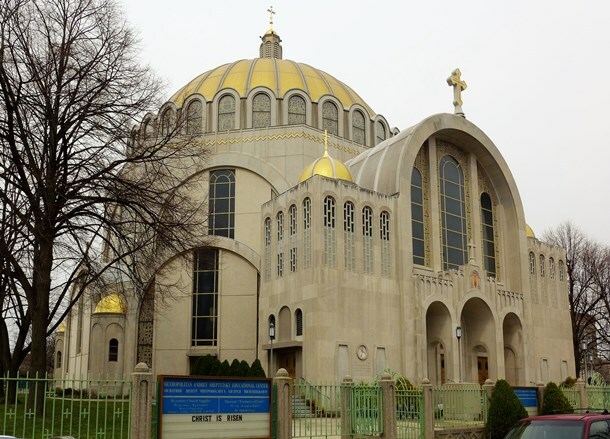 The parish of St. Rita was established in 1907 and was entrusted to the Augustinian Friars. The inspiration of St. Rita of Cascia, a 15th-century wife, mother, widow, nun and stigmatist, soon proved to be instrumental in caring for immigrant families. Many were drawn into devotion to the saint, who is the patron saint of the impossible causes, abused wives and widows. 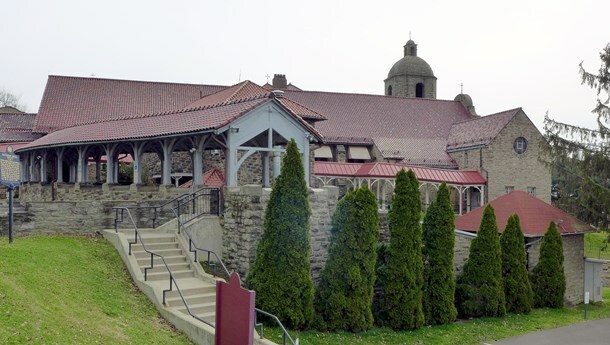 The shrine was designated a national shrine by the American bishops in 2003 “for its outstanding ministry and its effective service to the spiritual, liturgical and devotional life of pilgrims from across the United States.” Today, the National Shrine of St. Rita of Cascia still continues to provide for many needy families. 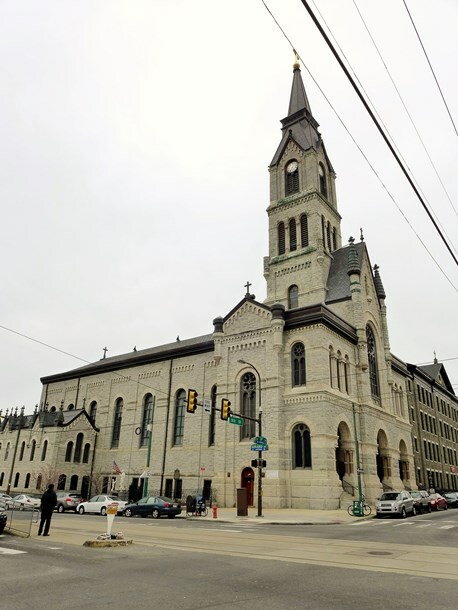 The National Shrine of St. Katharine Drexel is located in Bensalem, 30 km away from downtown Philadelphia. It is contained inside the Motherhouse of the Sisters of the Blessed Sacrament, which was founded by Katharine Drexel. Mother Katharine worked hard for the Black and native people who suffered from prejudice and unjust laws. She died at the age of 96 in 1955. 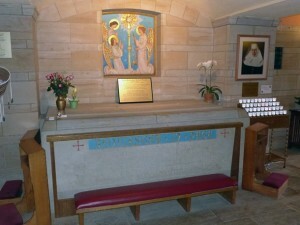 The remains of Mother Katharine lie under the main altar in St. Elizabeth Chapel in the motherhouse. She was raised to the altar by John Paul II in 2000, and is still the only canonized saint to have been born a United States citizen. 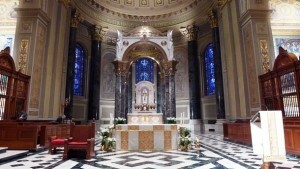 The shrine was designated a national shrine by the USCCB in 2008. 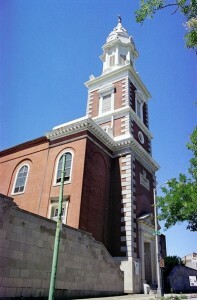 Old St. Joseph’s Church was the first Catholic mission in Philadelphia, founded by a Jesuit in 1729. The first chapel was built in 1733, and was replaced by a bigger church in 1757. The church is not easy to find because it is shielded from the street. This was for a practical reason to protect the church from anti-Catholic bigotry. Olde St. Augustine’s was the first church established by the Augustinian Friars in the United States in 1801. 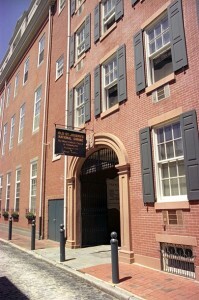 Even George Washington contributed to the building funds of the first church. The community founded St. Augustine Academy and became a famous musical centre in the 1810s. After being burnt down by anti-Catholic riots in 1844, the church was rebuilt in 1847. In 1976, St. Augustine’s Church was added onto the National Register of Historic Places. The church was also featured in the movie The Sixth Sense. The parish is now the home of many Filipinos. 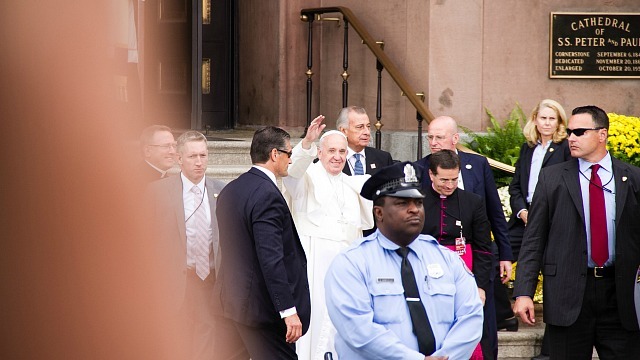 Follow live coverage of Pope Francis’ visit to Philadelphia on your favourite Salt+Light Television. 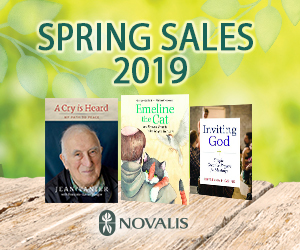 For readers in Canada, do not forget that you can watch Salt+Light Television free of charge through their cable or satellite during the months of September to November this year.